Hidden off of Yorkville Avenue, MoRoCo is combination retail store and restaurant. At the entrance is their chocolate and macaron shop; your eyes are in for a treat with the brightly lit, sterile looking, white and pink room. After passing the retail front, you’re greeted with the restaurant which is completely different – dim, dark grey & purple motifs and a cozy environment. Indeed you can come here for a meal since MoRoCo offers an extensive brunch, lunch and dinner menu. 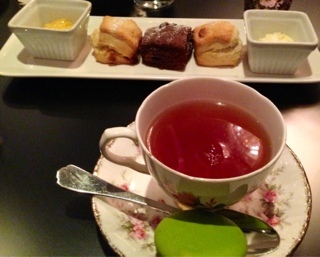 We visited after dinner just for some herbal tea and something sweet. After pursuing their extensive menu I settled on an artisan tea the Cream of Avalon ($10) which also came with a macaron. The tea was decent, sorry I can’t remember anything memorable about it, but the macaron quite delicious with a thicker cream filling and chewier texture. You weren’t given a choice of flavours but my mint and white chocolate one was lovely. For $18 you can get an artisan tea accompanied with three small scones, clotted cream and lemon curd. The plain scones were passable but we found the chocolate one too chalky. The clotted cream was good; we just needed more of it! In terms of the lemon curd although it is a unique offering, I’d much rather just have the regular strawberry preserve given a tart lemon cream is an acquired taste. Overall, I quite enjoyed the experience and glad to have found a place where you can have a cup without having the entire high tea experience. Coffee with desserts is very popular in Toronto, but my preference will always be for a nice pot of steeped loose leaf.